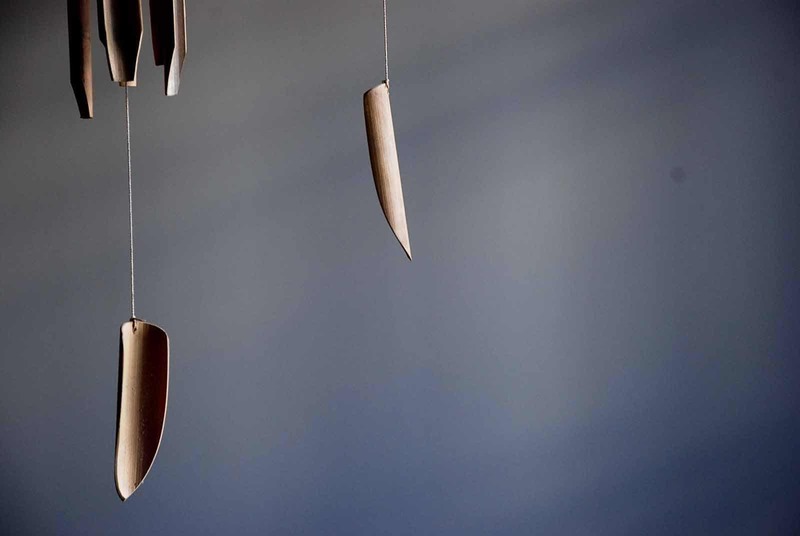 The initial Enjoy installation saw the work as a silent suspension over a white rice ground. 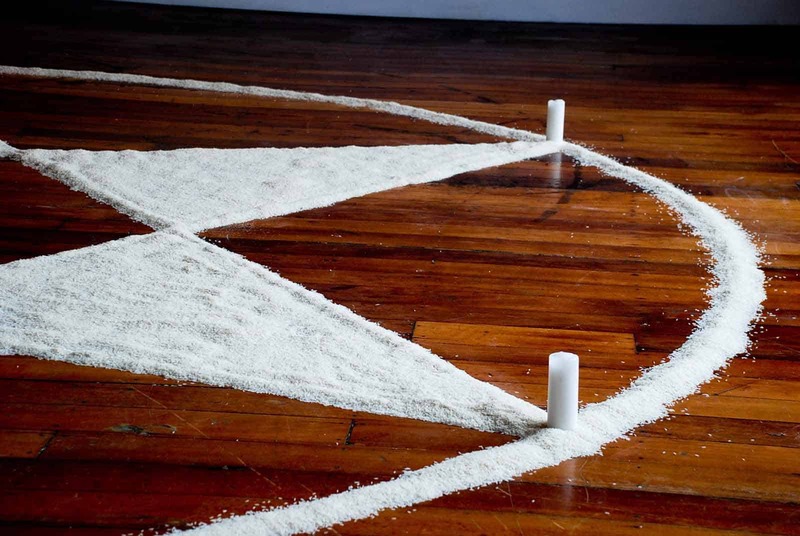 With cleansing components activating a sacred space as the installation prepared to become activated by its audience. 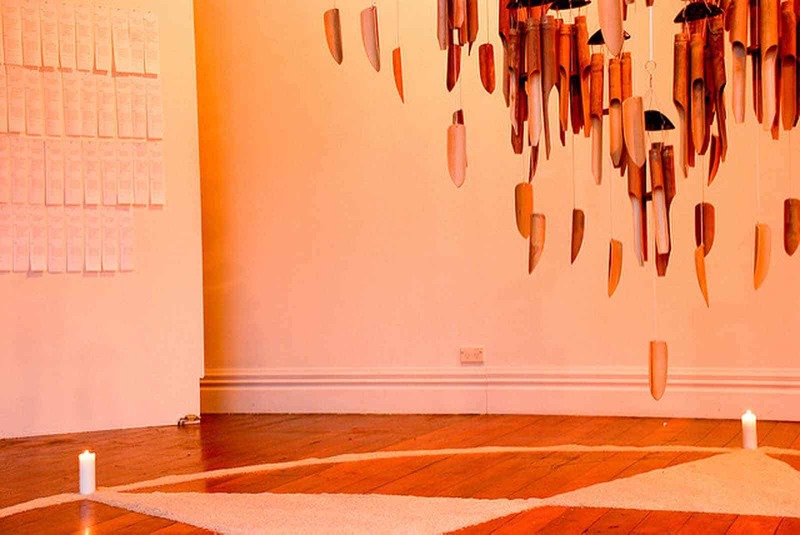 Triggered through participation, a multifaceted deconstruction and reconstruction through sensations of sight, sound and experience. 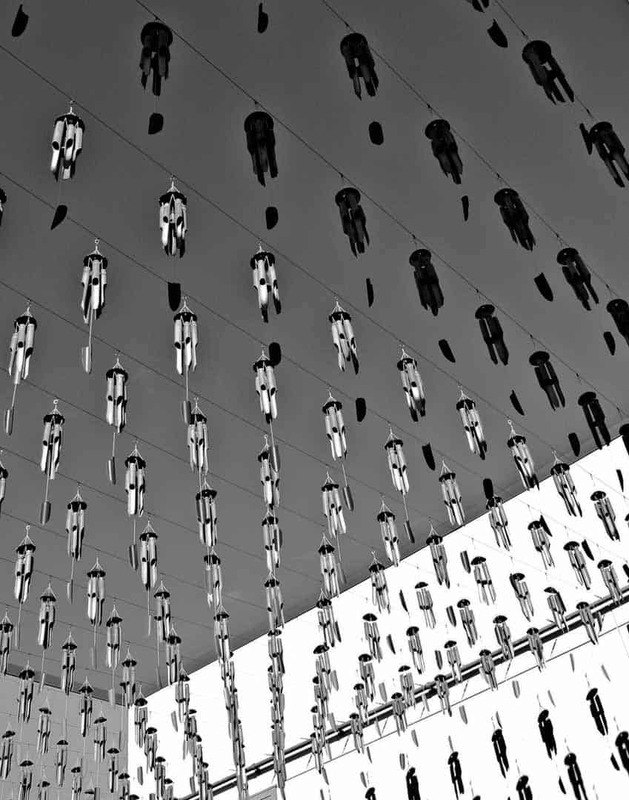 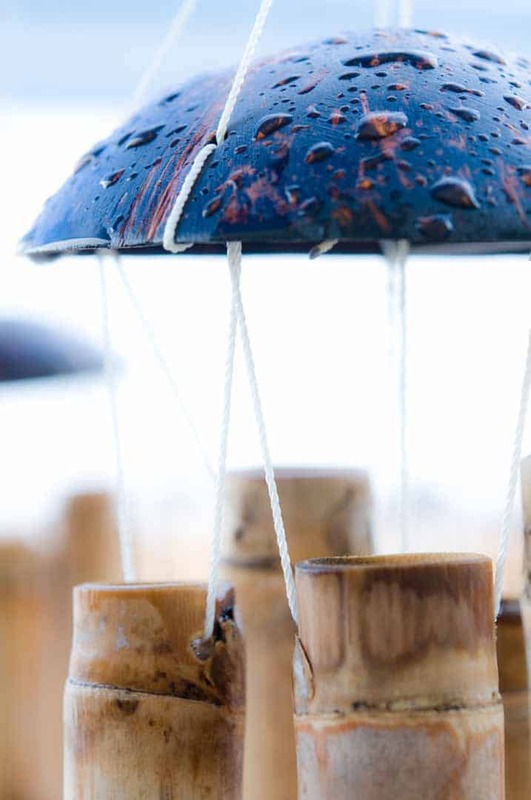 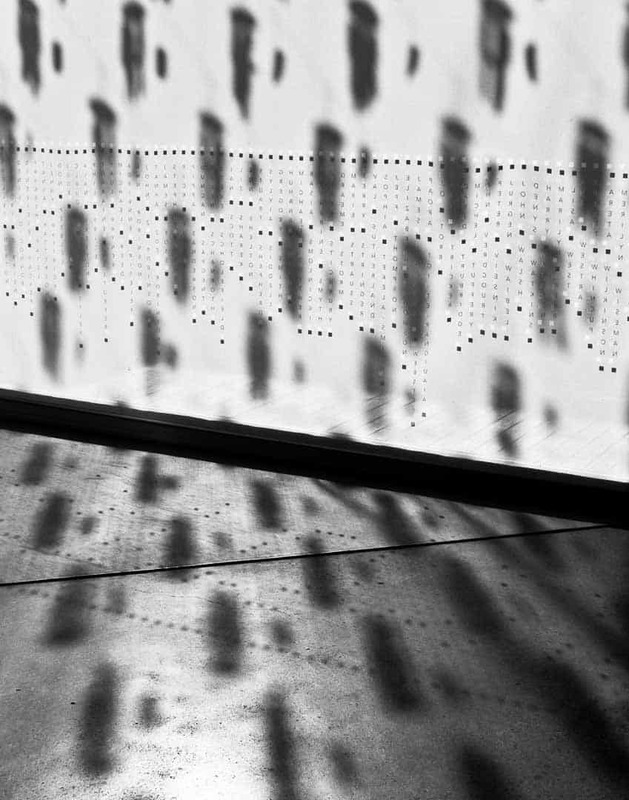 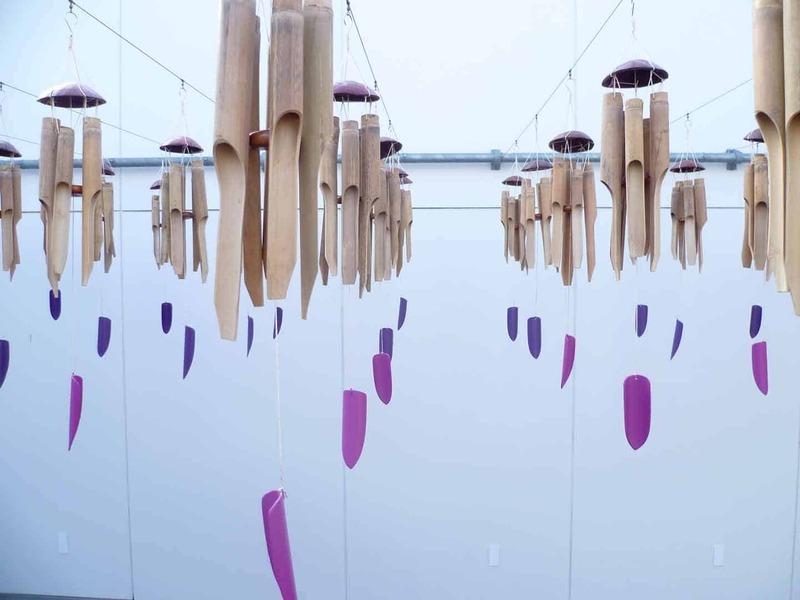 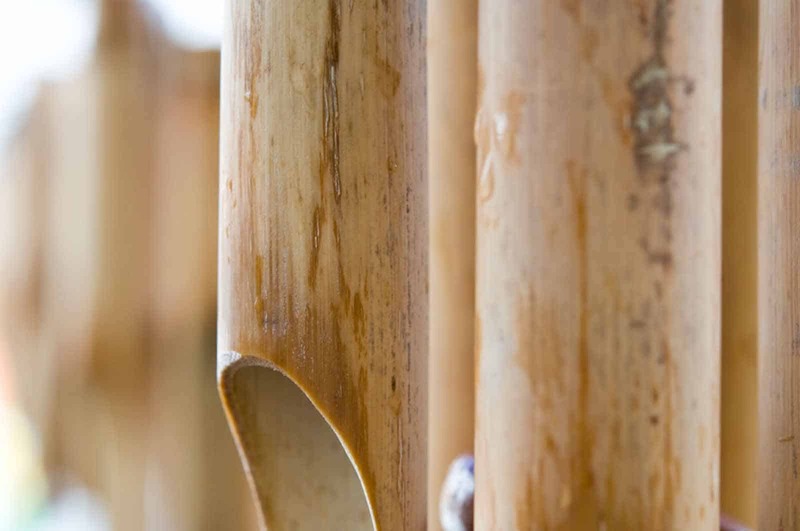 The physical experience of exchange activates the wind chimes as the work transformed from one cohesive large-scale work to a series of multiples, gifted as single parts. 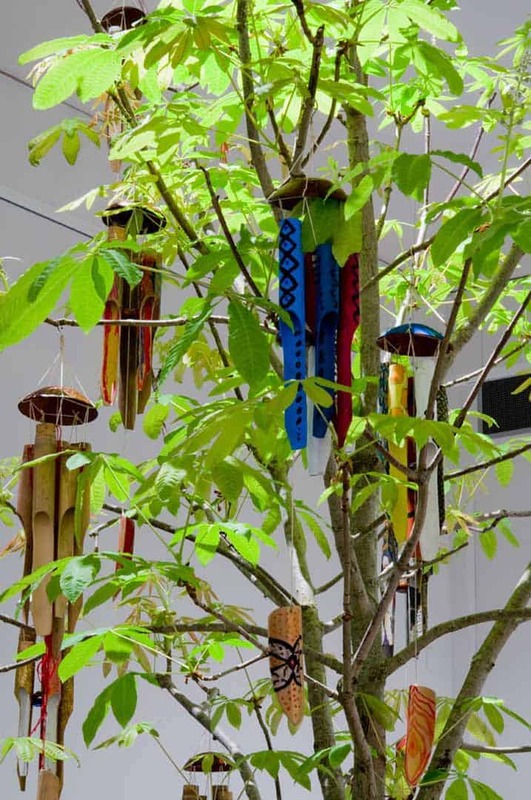 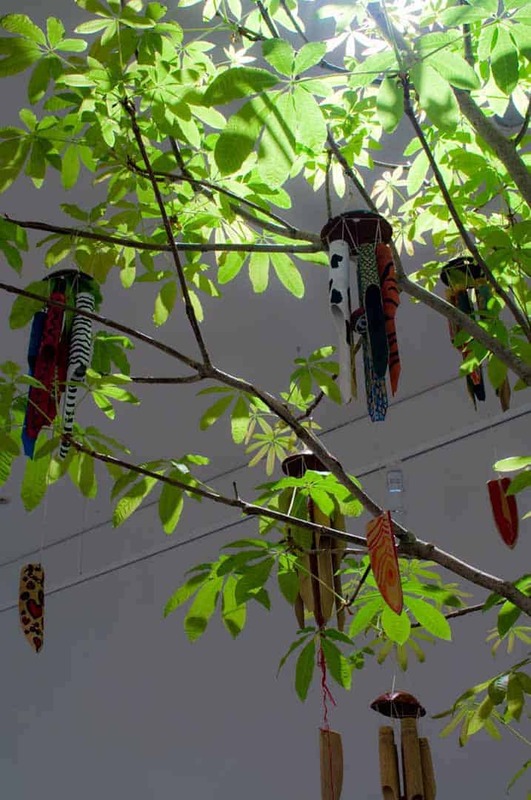 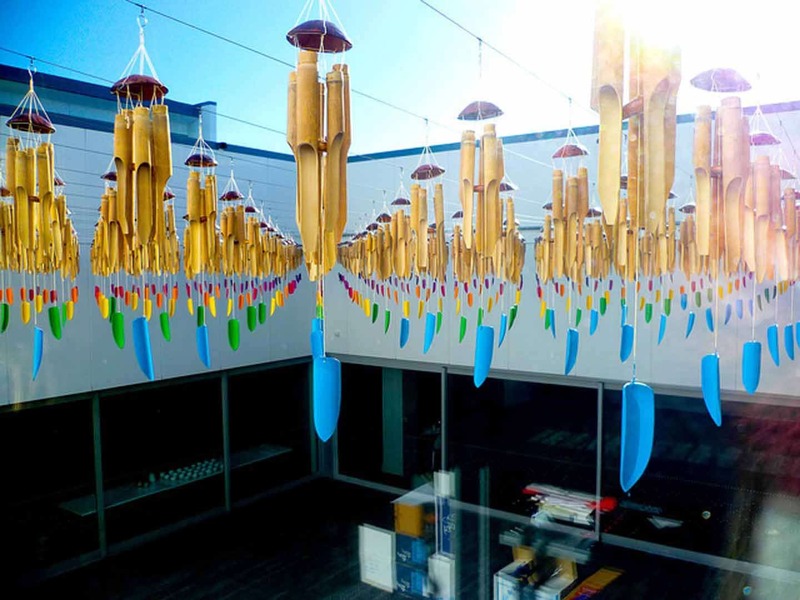 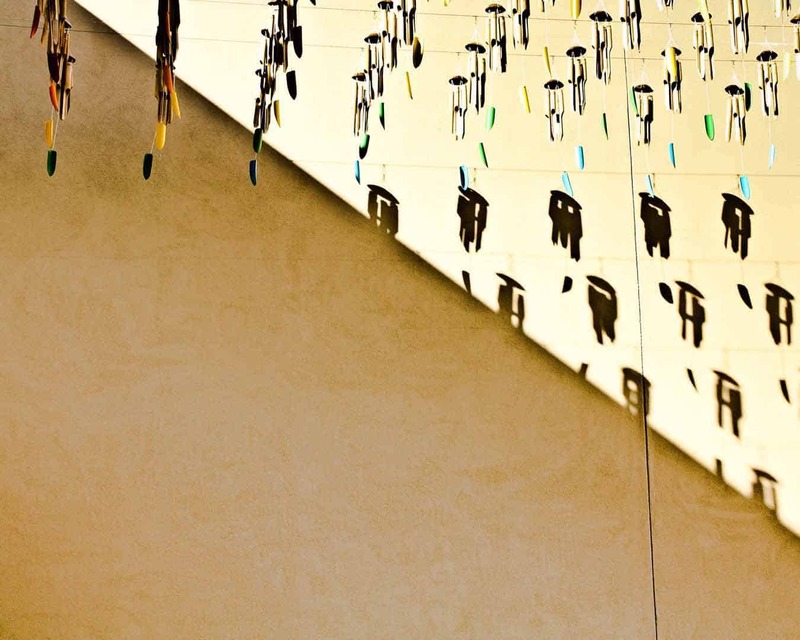 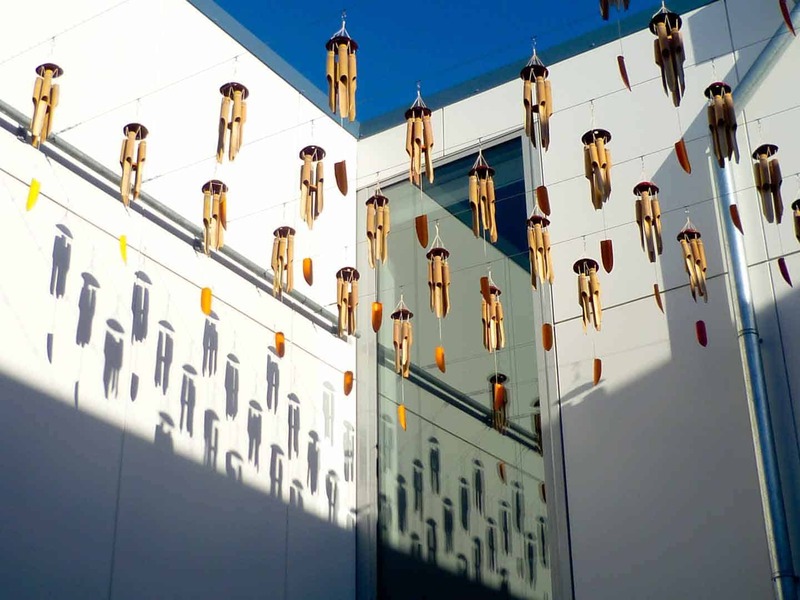 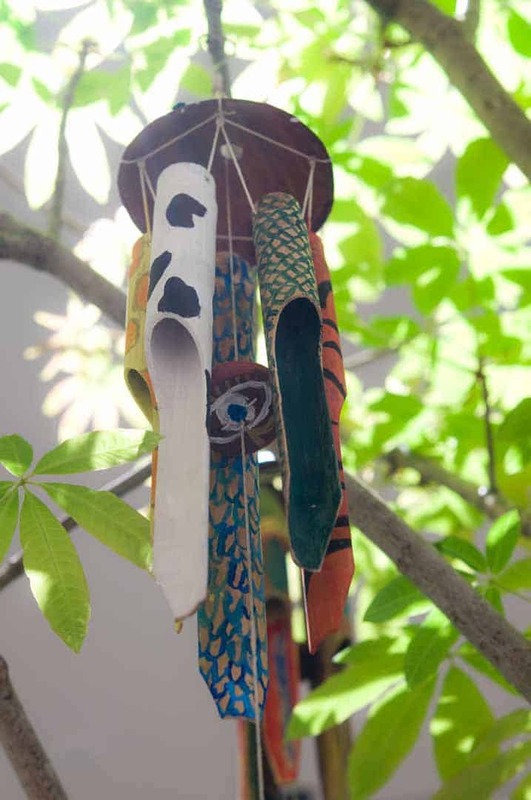 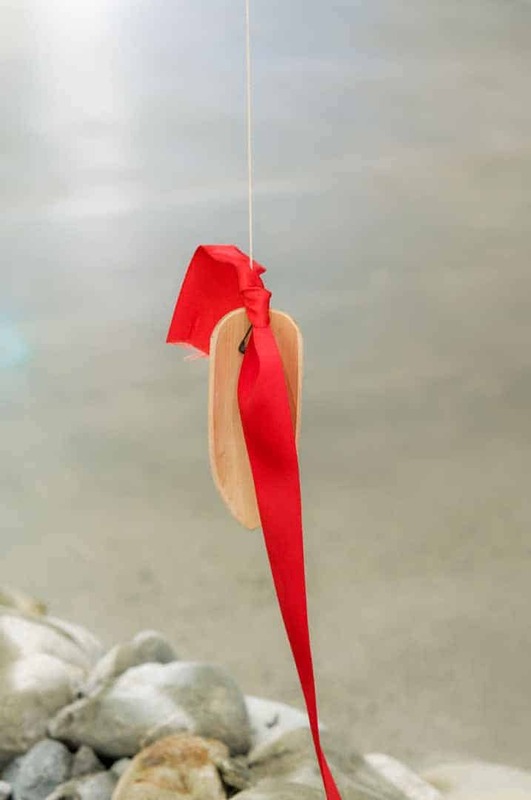 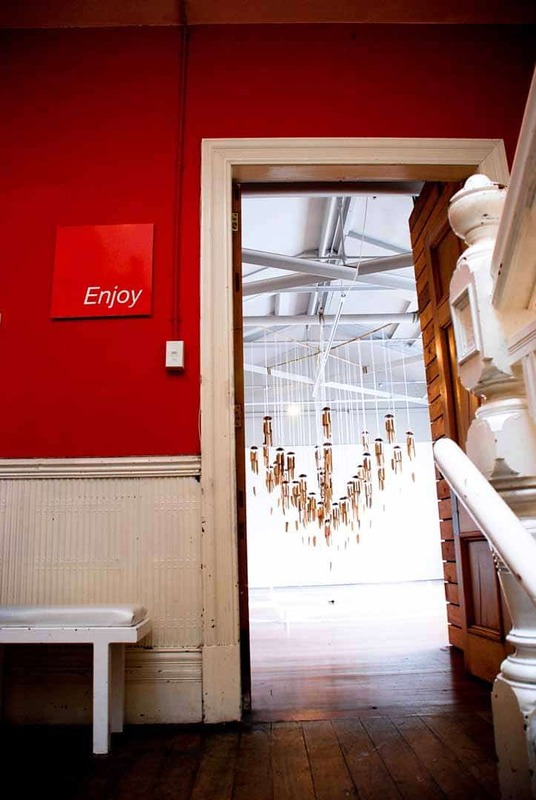 The constantly changing artwork saw the gallery fall silent again as all the wind chimes were relocated to the tree at the Dowse Museum after being decorated by the audience, linking the artist run space with the Museum. 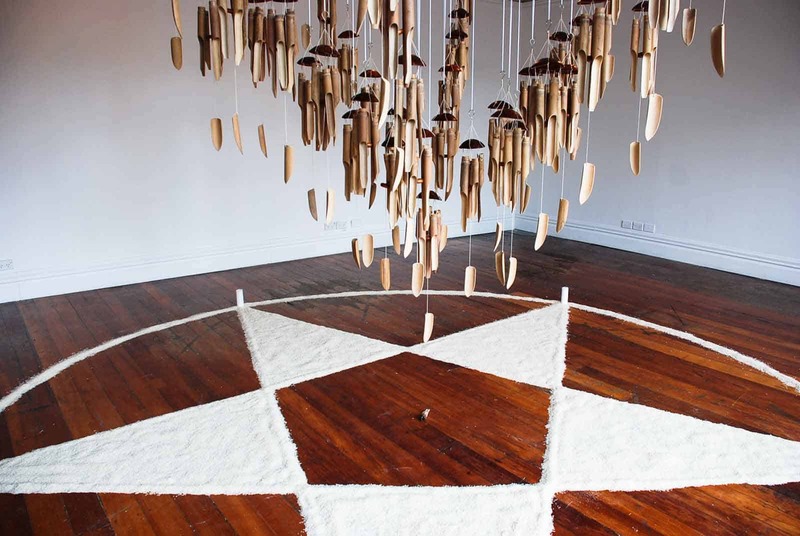 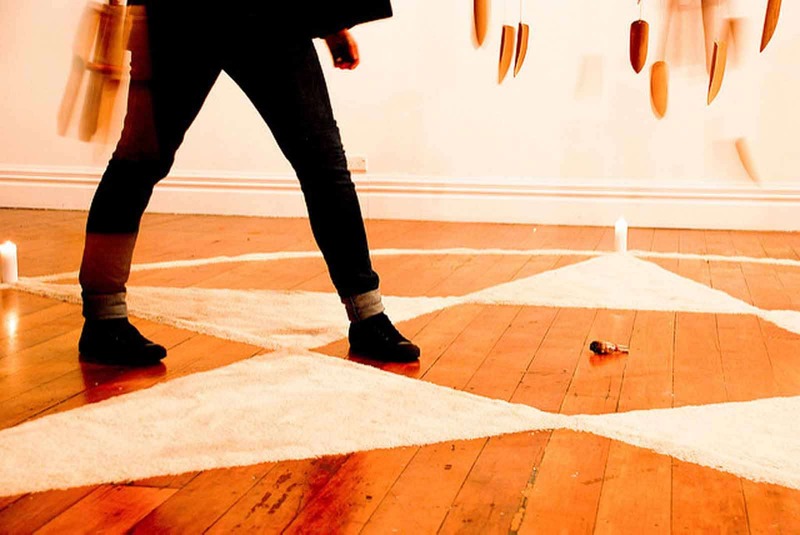 This process helped to re-examine the division between ritual space and productive space. 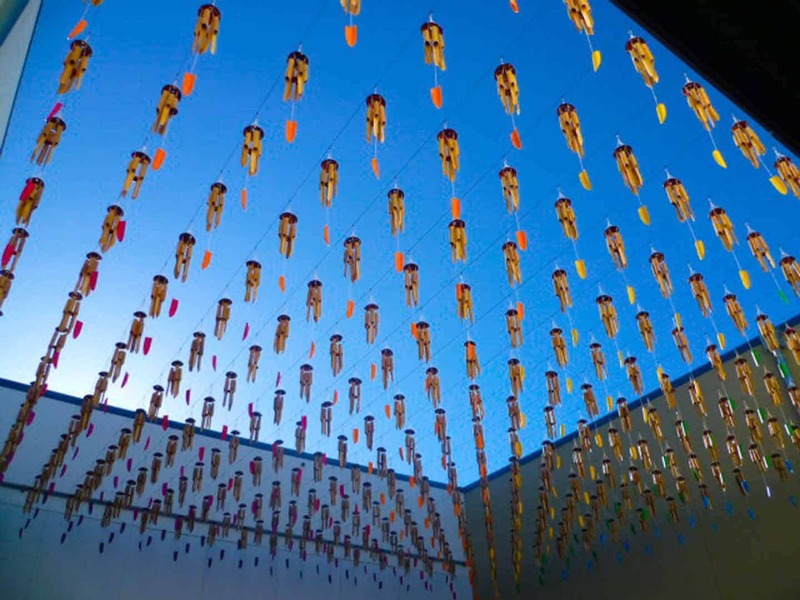 As means to initiate inquiry into ways which cities understand their boundaries in relation in commercial and sacred space. 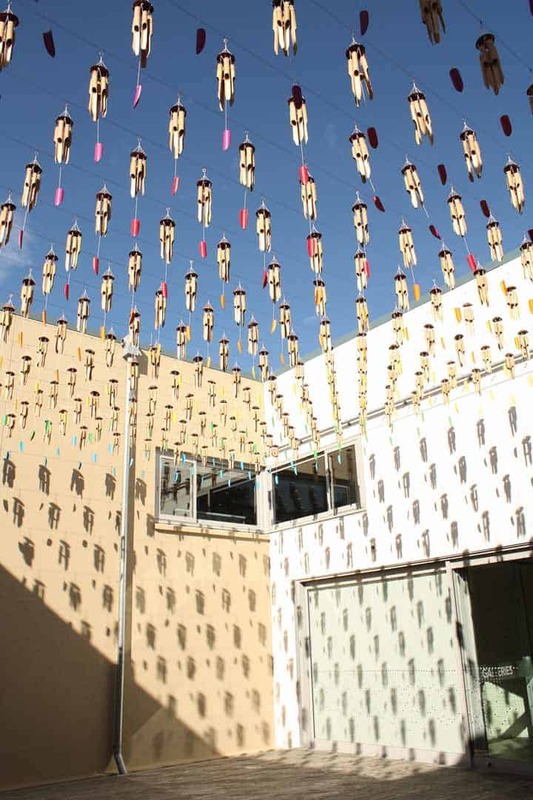 The work aimed to emphasise the interconnection of sacred and political realms, and carry forward the understanding of polis not just as a collection of buildings, inscriptions, governmental procedures, or historical events but also as lived experience. 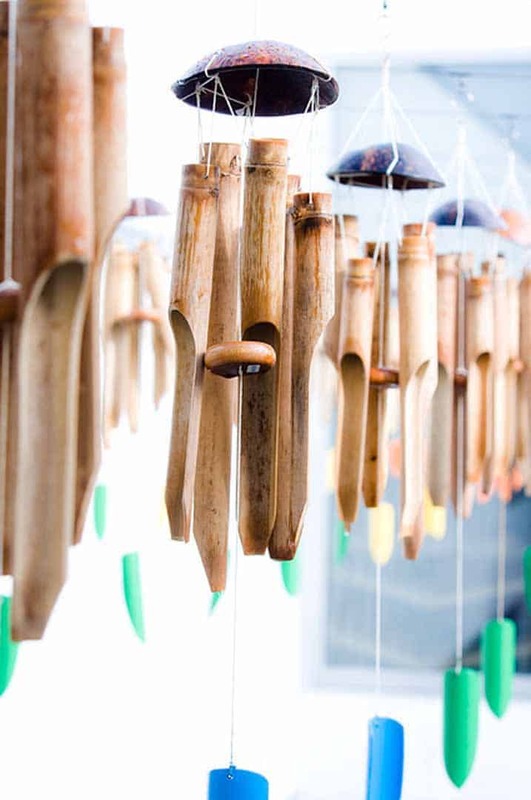 The offering the initial wind chime as a gift, alludes to an anthropological, economical, psychological, and utopian ideal of object and service, material and non. 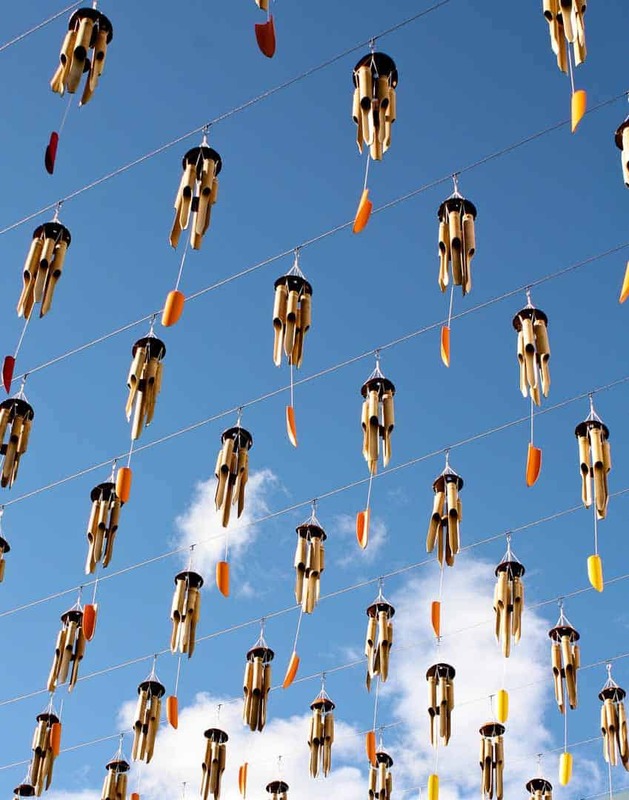 Where the ‘giving’ and the outer gift can become a vehicle of culture. 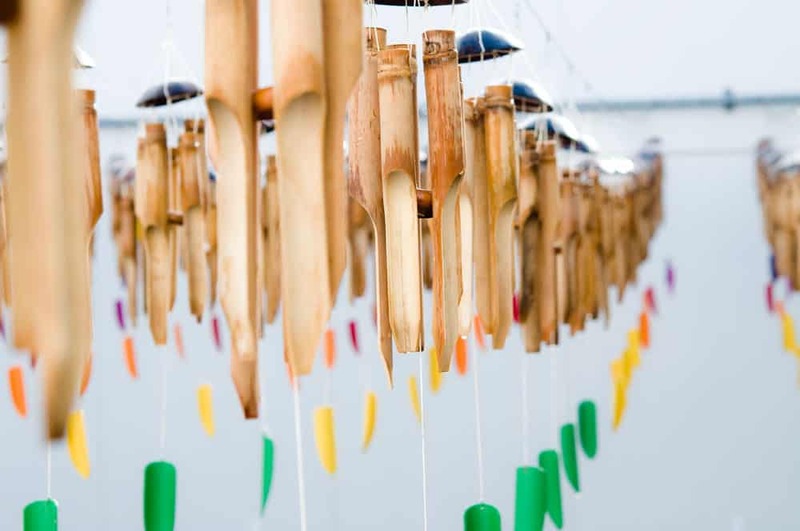 This methodology can be applied to examining our current immersion in the market economy whilst attempting to create an alternate economy, as we collectively engage in social arts practice. 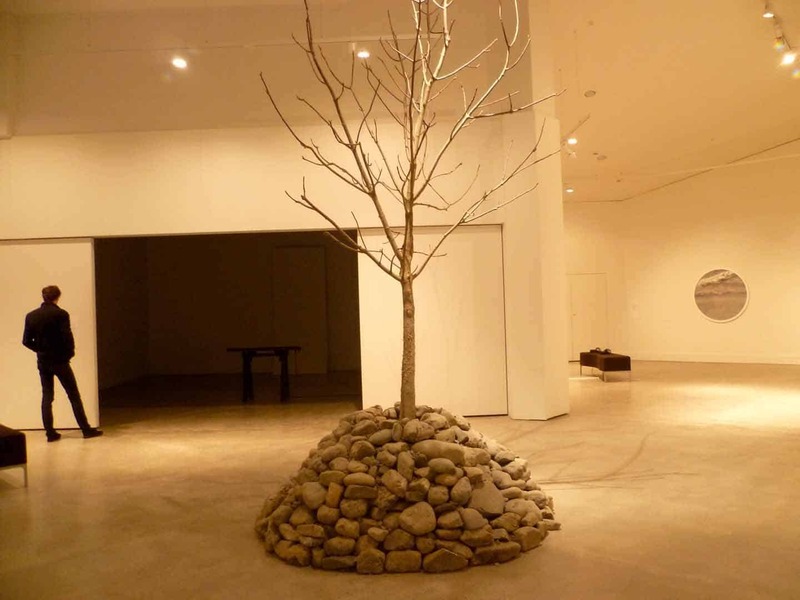 The physical work reflects the aforementioned criticality as it sets forward a motion a social intervention achieved by the community. 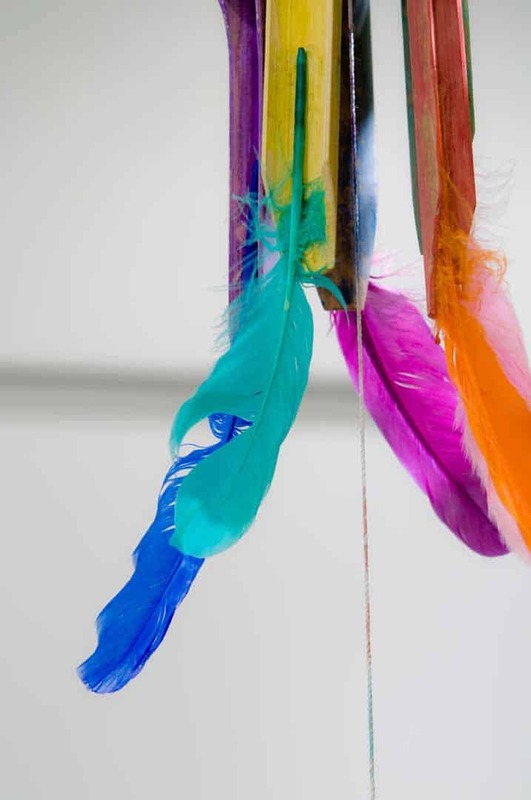 Creating a work that is beyond duality, encompassing a greater whole. 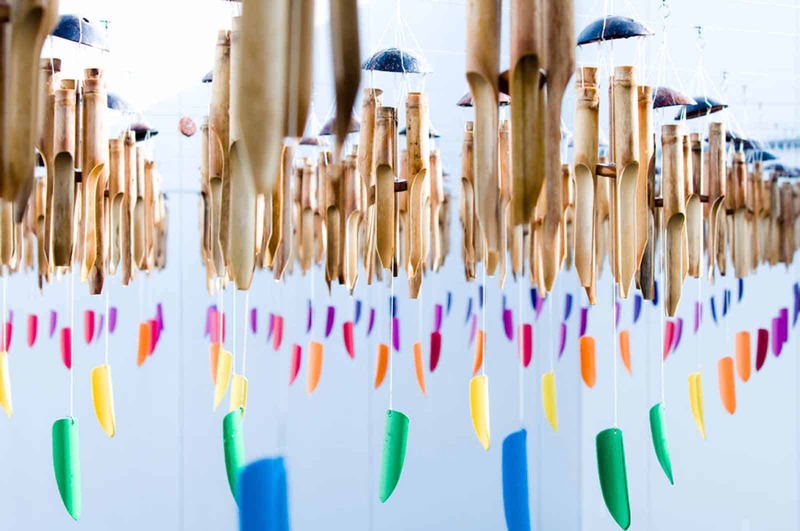 As inclusion of process makes the work evolutionary in a literal sense, the audience becomes the maker shaping the works form and ultimate result. 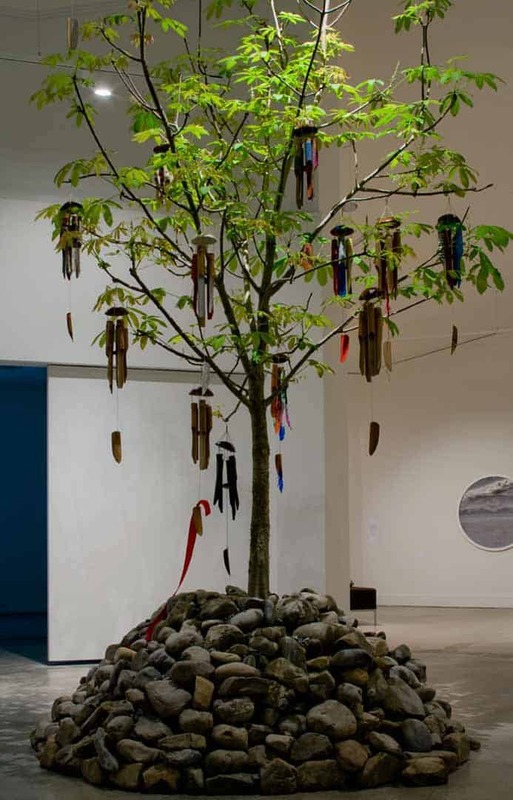 As the term Botanical Dichotomy suggests a mode of branching by constant forking, as in some stems, in veins of leaves, essentially a form of growth. 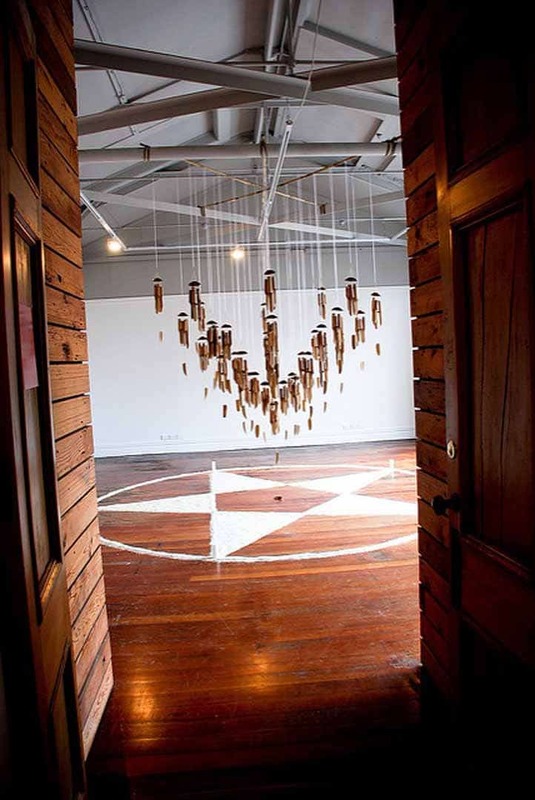 The overall artwork is an attempt to harness the energy of potential, whilst leading to a more cohesive, involved and invested community.